JC: The only explanation I ever heard he made is, he felt sorry for Mrs. Kennedy and he wanted to show his respect for her. Well, again, you make a comment—and I think other people do—that Ruby makes a statement, and that’s exactly what happened. Well what do you think he’s gonna say, when they catch him red-handed there, and throw him to the floor and cuff him up again? You think he’s gonna make a confession at that time? JC: Again, the only fact I know is that Jack Ruby shot Lee Harvey Oswald. Why he shot him, I don’t know. How he got into that place at the time he did, I don’t know. Why the Dallas police department elected to have administrative problems they did that moment that delayed their transfer fifteen or twenty minutes, why that happened, I don’t know. 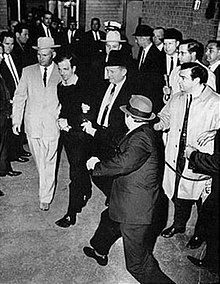 I only know that Jack Ruby had a matter of seconds—not minutes, not hours, not days—he had a matter of seconds, to do what he did, and he had nothing to do with the Dallas police department delaying their transfer by a fifteen or twenty minute period of time. Ruby wanted to be a very vocal, aggressive, tough-shooting kind of a guy. But he was really just—I don’t know if the Mafia had a ladder or not, but he’d be about as low on the ladder as you could get. But he wanted to be on the top of the ladder. So anybody under him, or anybody subservient to him, an employee or a dancer or anything like that, he’d put on a pretty good show with them you know. 11 Waldron, The Hidden History of the JFK Assassination, 121-23. The evidence cited, in addition to some discussion of financial records, is that Marcello told FBI informant Jack Van Laningham that he, Marcello, had set up Ruby in the bar business in Dallas, and how he, Marcello, had later caught Ruby embezzling money. D: OK. Mr. Hunt was not involved with the Adlai Stevenson incident that happened just before Kennedy arrived, was he? Adlai Stevenson arrived in Dallas and had some people demonstrate against him. JC: Well in my book I covered the Adlai Stevenson story. 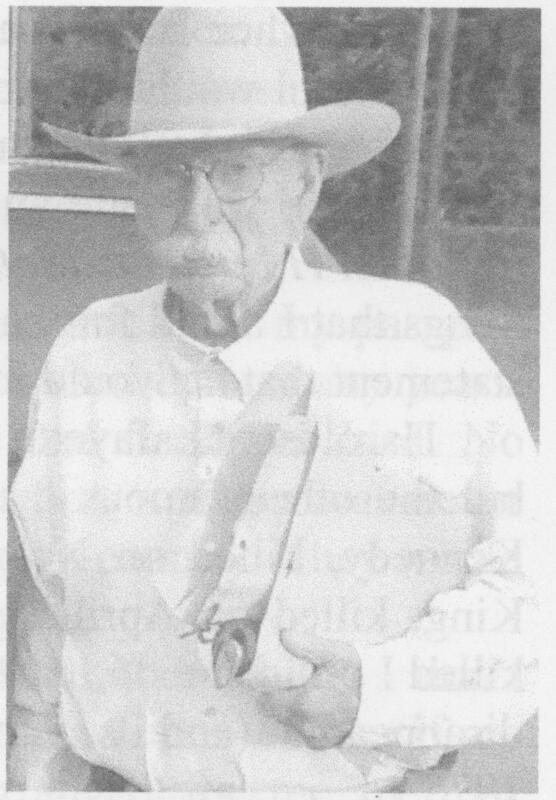 Anytime a person of any renown came into Dallas, especially a political person, all wanted to see Mr. Hunt. Mr. Hunt really had no interest in people of Adlai Stevenson’s level or background or anything like that. But as a businessman, if they came to his office he would normally see them if they came to my office first. Adlai Stevenson did come to Dallas, and did come to Mr. Hunt’s office. I did visit with him, and Mr. Hunt stepped into my office, they exchanged a few pleasantries. But that’s just the beginning of the story. There was a person that came into the office the same day that Adlai Stevenson did. And Mr. Hunt had just written and published a book—his book—called Alpaca. In my book I’ve got the name of the person. But he came in and he wanted to meet Mr. Hunt. And he and I were talking about like you and I are, and Mr. Hunt hollered out and said, “John, who’s that out there?” Well I had the man’s name. And he said, “Well what does he want?” I said, what he wants is an autograph on a copy of Alpaca. Well that’s all Mr. Hunt had to hear. He just dropped everything and he came out and he wanted to meet this fellow, and sign and autograph his book Alpaca. So he comes out and they visit three or four minutes, probably two minutes, something like that, and Mr. Hunt takes his book and autographs it. U.S. 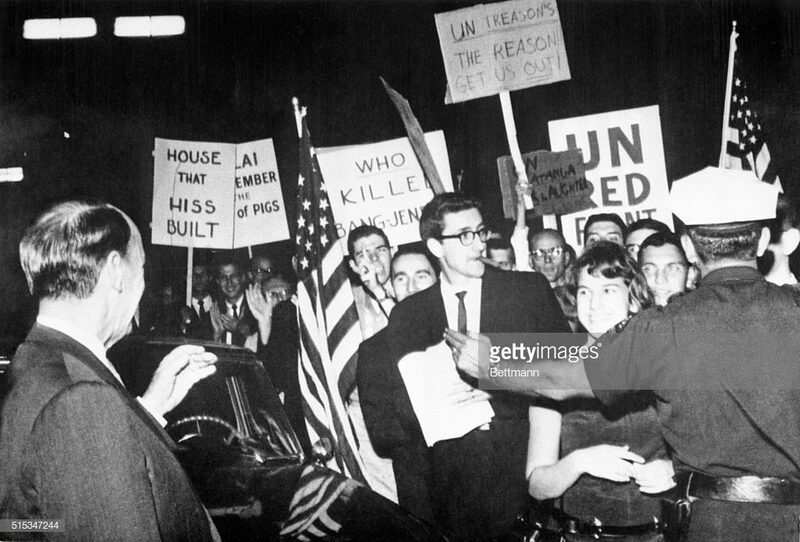 Ambassador to the United Nations Adlai Stevenson (L) walks past sign carrying demonstrators as he leaves Dallas Memorial Auditorium after delivering a speech that was the highlight of U.N. Week celebration here 10/24. Stevenson was heckled and booed during the speech and as he was struck on the head by one of the demonstrators and spat upon. Well when that fellow left our office, he goes down on the street. Adlai Stevenson is still down there. And he goes up and spits in his face. I don’t know whether you recall that story or not. It was all over the world. GD: You were with Mr. Hunt when he saw this on TV? JC: Well yeah. Yeah. So I said, well I think I can get it back for you. I knew the bell captain pretty well over at the Baker Hotel. And I had one of the girls in the office—this was about 4 o’clock in the afternoon—I had one of the girls in the office call this fellow. And she just called his hotel room and wanted to know if he’d have a drink with her down in the lobby there. So of course he jumped at the opportunity. And I took her over there. And I was hid around the corner. She went into the lobby, and he came in. And when they sat down, the bell captain took me up to his room, unlocked the door, and locked me in it. And I went through all of his belongings, and found Mr. Hunt’s autographed copy of Alpaca, and took it back to him. GD: You had pretty versatile job duties. JC: Well I could <unintelligible> a phone, break into buildings, embezzle <unintelligible>. GD: Did they teach you that at law school? JC: No, you learn that through hard knocks. But anyway, that’s an interesting story. And it could have been a little bit—Mr. Hunt’s concern over him autographing a book for a person that had just spit in the face, is the same theory he had on Lee Harvey Oswald testifying in court, or James Earl Ray testifying in court that he was influenced by Life Line. 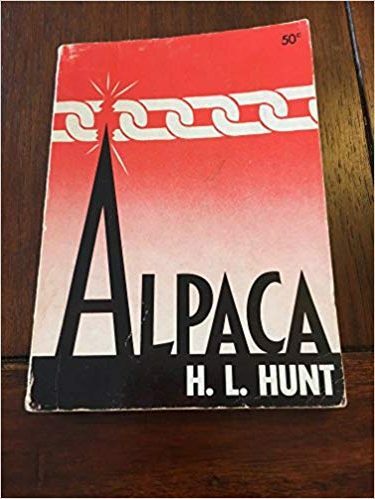 If the police had gone over there and searched his room and came up with an autographed copy of Mr. Hunt’s book Alpaca, it would have been on all the news services all over the world. JC: And Mr. Hunt couldn’t go over and break into his room. And it’s just luck that he left the room at his hotel, left the book in his hotel room, luck that I knew the bell captain over there that would let me into his room there, you know. Nothing planned—it just fell into place there. When the lady that I employed—not employed, that I worked with—to have a drink with that fellow—I had her sit where his back would be to the exit door, so when I left she saw me, and she got up, excused herself to go to the girls’ room, and left and she never saw him again. GD: She had never met him before? GD: How could he take a call from a woman he’s never met? JC: That simple, nothing complicated—no planned deal or anything like that. Just an—an orangutang could come up with that kind of a theory. Posted on 2018-11-13 04:47:50 GMT+0000 by Neil Godfrey. This entry was posted in J. F. Kennedy assassination and tagged Curington interview. Bookmark the permalink. Mr. Curington’s remark to me in the interview above that if Ruby did not follow what Curington believed was an order from someone to kill Ruby, that “he [Ruby] could very well have been ground up in a sausage grinder”, prompts this comment from me. Curington may have meant that as simply a general figure of speech referring to Mob violence, but I later noticed an eery evocation of a curious detail I picked up in my reading. There was a prominent Dallas restauranteer at the same time named Joseph Campisi, who was considered #2 local Mob person in Dallas next to Civello, and after Civello’s death in 1970 succeeded Civello as the new #1. Campisi had personal and telephone contacts with Marcello, the Mob boss in New Orleans who also controlled Dallas. 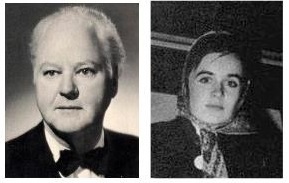 After Ruby shot and killed Oswald, Campisi was Ruby’s first visitor to Ruby in jail. What I noticed, which I have never seen attention called to in print, is that 260 pounds is the weight of a corpse. Disposal of bodies such that they cannot be found by authorities is always a technical challenge in Mob killings. It sounds macabre, but I would be curious to know whether anyone at Marcello’s end actually ate that sausage. “In an FBI interview on January 14, 1964, [Dallas Mob boss Joseph] Civello stated that he had known [Jack] Ruby casually ‘for about ten years.’ Like fellow Mafioso Joseph Campisi, however, Civello was being modest about the extent of his association with Ruby. “The Ruby-Civello relationship was illuminated by Bobby Gene Moore, who grew up in Dallas and worked for Ruby at various times between 1952 and 1956 as a pianist in the Vegas Club. After the assassination, Moore was prompted to contact the FBI by a statement on television that his former employer had no gangster connections. He was interviewed by agents on November 26, 1963 in Oakland, California. “Moore told the FBI of deals involving Ruby, two Dallas policemen, and local underworld figures; several of his allegations were verified years later by arrests for the activities he described. But most interesting was Moore’s report about an Italian importing company at 3400 Ross Avenue in Dallas, where Moore was employed during the early 1950s. Moore was characteristically accurate when he told the FBI he suspected that his employers, Joseph ‘Cirello’ and Frank LaMonte, might have been importing narcotics. For the Dallas directory listed the store at 3400 Ross Avenue to a brother of Mafia boss Joseph Civello. 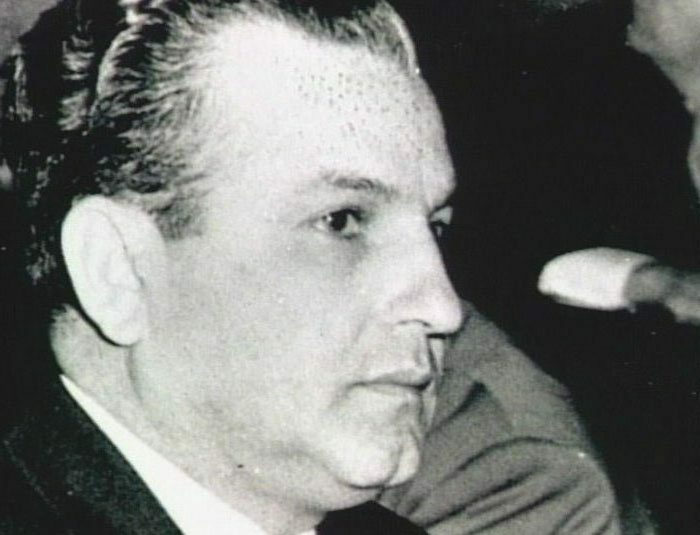 The Joseph “Cirello” transcribed by the FBI was thus Joseph Civello, whose business fronts included import-export, olive oil and cheese, and whose criminal activities did in fact include narcotics dealings. One more item of interest. In the interview Mr. Curington reconstructs that Jack Ruby, the killer of Oswald, did not want to kill Oswald but had no choice. The following detail, not mentioned by Curington, lends support to that interpretation. As recounted by Dallas Police officer Billy Grammer in this Utube video (https://www.youtube.com/watch?v=kEjT7XCN_R0), Officer Grammer was a dispatcher on duty at the Dallas police night desk the night before Oswald was killed. Grammer received a phone call about 3 a.m. that night from an anonymous caller warning that Oswald would be killed the next morning when Oswald was scheduled to be transferred. The anonymous caller said the time of Oswald’s transfer must be changed or else “we [the anonymous caller] are going to kill him [Oswald]”. The warning, although immediately reported to higherups, went unheeded, the transfer of Oswald proceeded, and Oswald was shot to death by Ruby during that transfer. Officer Grammer said that the caller knew details of the planned transfer. When Grammer asked the caller who he was, the caller replied, “I can’t tell you that but you know me.” After Ruby shot Oswald, Grammer realized that the caller he had spoken to was Jack Ruby. A separate, different video of Billy Grammer telling the same account can be seen starting at about 1:06:44 in this 1988 Jack Anderson TV documentary here: https://www.youtube.com/watch?v=fvpCoOwz3dI.